Finally, a new recipe in 2015! Cheers to a year of good food. It’s been (surprise, surprise) EXTREMELY cold here in Baltimore, and I was craving something hot in both temperature and spiciness. When I biked home from work the other day in something like 20 Fahrenheit, after I managed to thaw out my hands and face, I discovered that our heat hadn’t been turned on yet that day. If the house is really cold, the first thing I do is scheme about what I can cook to heat up the kitchen and hang out in it while the heating system boots up. And thankfully, I had planned ahead and had the ingredients for this spicy chickpea turmeric stew ready to go. Or rather, I thought I had the ingredients ready to go. I wasn’t being very assertive at the grocery store and wound up buying a lime without really comparing it to the other ones on the display. This occurred due to trying to dodge some people who were standing in the way because I didn’t want to ask them to move. Anyway, that’s my embarrassing story for the day. I’m glad that it at least somewhat contributed to this awesome winter turmeric stew. I used fresh turmeric, which was an absolute delight, and also cost a lot less than that lime did! 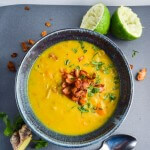 The difference between fresh turmeric and ground dried turmeric is rather like the difference between fresh and ground ginger – both are delicious, but the fresh stuff can’t be beat. Either one will work in this recipe! I also used freshly squeezed pineapple juice to add sweetness and flavor, and I think it pairs really nicely with the coconut milk. I really, really like coconut bacon; however, I find that the strong coconut flavor prevents me from using it in dishes that aren’t Asian- or Caribbean-inspired. This time around, I decided to follow that path of inspiration through to the seasoning, and toast the coconut in a fragrant mixture of Thai red curry paste, pineapple juice, and soy sauce. 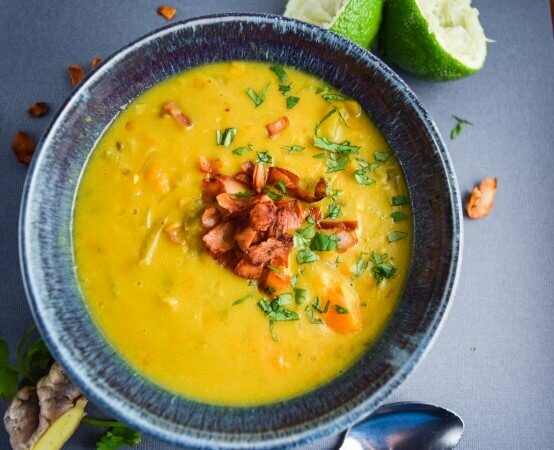 It’s still a pretty subtle difference from ‘classic’ coconut bacon, but I think it’s a nice touch when paired with the turmeric stew. I added regular and sweet potato to the stew to make it nice and hearty on its own, but it could also be served with jasmine rice. 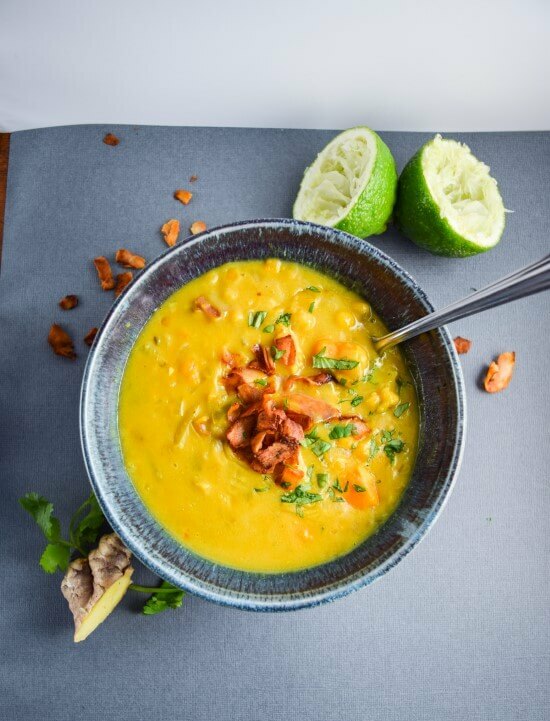 Hearty and spicy chickpea turmeric stew, made with nutrient-packed sweet potatoes and topped with crispy Thai red curry coconut bacon. Gluten-free, grain-free, vegan recipe. Preheat the oven to 275 degrees Fahrenheit. Line a baking sheet with parchment paper. Dump the flaked coconut onto the baking sheet. In a small bowl, whisk together the rest of the ingredients, making sure to evenly incorporate the curry paste. Drizzle the mixture over the coconut, and use your hands to toss it to coat. Spread it out in an even layer and place in the oven. Bake for about 20 minutes, stirring every 5 minutes (important!) or until the liquid is absorbed/cooked off and the coconut is evenly browned. Let cool before using. The coconut bacon will keep in an airtight container at room temperature for at least a week. In a saucepan, heat a small drizzle of neutral oil (I used grapeseed oil) over medium heat. When the oil is shimmering, add the shallot with a sprinkle of salt, and stir. Cook for about 2 minutes, or until starting to soften. Add the pepper, garlic, turmeric, and ginger with another sprinkle of salt, and stir. Cook for 5-7 more minutes, stirring occasionally, or until the shallot is soft. Add the curry powder and cook for 1 more minute, stirring frequently. 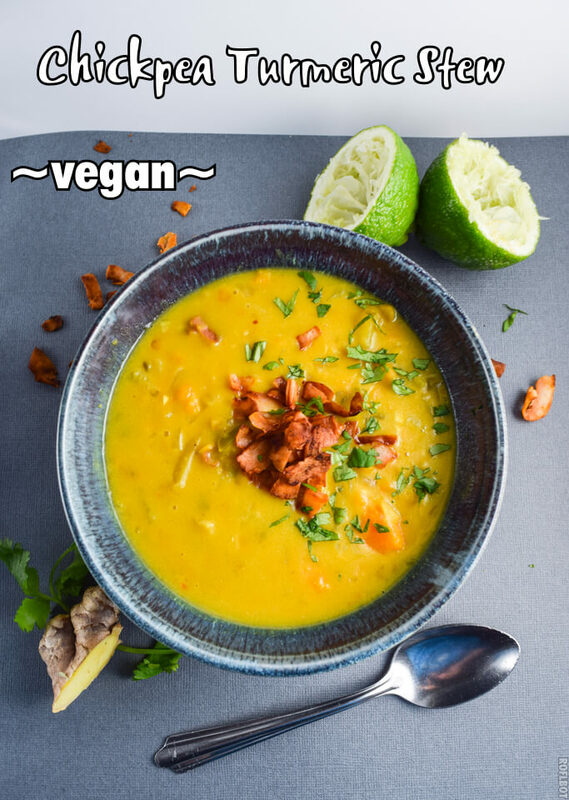 Stir in the coconut milk, water, pineapple juice, soy sauce, and cubed potatoes and sweet potatoes, along with another fat pinch of salt. Bring the mixture to a gentle boil. Once the mixture boils, reduce the heat to a steady simmer and cover the pan. Cook, stirring occasionally, for 15-20 minutes or until the potatoes are cooked through. If desired, use the back of your spoon to mash up some of the potatoes to thicken the stew slightly. Stir in the cooked chickpeas and lime juice and let simmer partially covered for 5-10 more minutes. Add more salt to taste, and serve hot, topped with fresh cilantro or green onion, and the coconut bacon. I found a big jar of unsweetened 100% pineapple juice with pulp for about $3 in the natural section of my regular grocery store. The extra not used in this recipe is really delicious for drinking on its own, mixed with carbonated water (naturally sweetened pineapple soda! ), or in cocktails. Other chili peppers can be used instead of serrano. Adjust the amount based on the spiciness of the pepper and your own preferences. Nutrition facts exclude the coconut bacon. I already think this is going to be on my 2015 favorites list :). Thai red curry coconut bacon adapted from this coconut bacon recipe. This post contains an affiliate link. Read my advertisement policy for more information. Didn’t have an oven, so I didn’t make the “bacon” but WHOA does this have flavor. I used purple Okinawan potatoes as they are plentiful here in Hawaii. Very much enjoyed it. The purple potatoes in this sounds great! Thanks for sharing! Oh wow! I just made this. It is so delicious! This was my first time cooking with fresh turmeric root. The flavor is so intense. Just wow! I love this coconut bacon too. Thank you for a fantastic recipe! I didn’t have any pineapple juice so I just subbed in more water. I don’t know what a serrano pepper is but I had some Scotch Bonnet peppers in the freezer from last summer’s crop so I popped one of those in well chopped up. I don’t like my food TOO hot! Also didn’t fancy the coconut bacon, but I had everything else and just topped it with some cut chives and shredded basil and served it on a small bed of coconut flavoured basmati. It was absolutely delicious, and I have enough left for lunch tomorrow and to freeze some! (I’m the only vegan in the family). Totally lush – the lime juice just makes it. I’ll get some pineapple juice for the next time. I am very sorry that it was so stressful to buy that lime. Akward shopping situations are worst.